From hair salon to TV news, Star-Bulletin/MidWeek readers voted for their favorite places to get a variety of services. "What this award means to us is that people have recognized our commitment to quality and integrity with everything we do," said Mona Wood, publicity director for Aveda Lifestyle Salon & Spa, which took first in two categories: Spa Services and Massage. "I think what makes us No. 1 is a combination of two things. One is the whole Aveda philosophy, which is beauty from the inside out and using only plant-based ingredients. The other thing is our people: We only hire the very, very best. "The staff at Aveda go through ongoing training. For example, we just came back from Milan (Italy) for the Aveda Global Conference and we will again be doing hair at Fashion Week in New York in September. We're always on the cutting edge of what's going on with hair and fashion." In Hawaii, there is only one official Aveda Lifestyle Salon & Spa, and it's at Ala Moana Center. Services include hair care and makeup, hand and foot care, waxing, facials, wraps and massages, including pregnancy massage. There are seven massage therapists at Aveda, offering a variety of massage services, as well as signature therapies. Before each treatment, guests are taken to a relaxation area where they are treated to a sensory journey, featuring aromatherapy and a foot massage. When two unforgettable earthquakes shook up Hawaii Oct. 15, 2006, anyone who had a radio was most likely tuned to KSSK FM 92.3/AM 590, which serves as the state's designated emergency action system radio station. The earthquakes hit on a Sunday, but it was popular weekday morning personalities Michael W. Perry and Larry Price on the microphones delivering information from civil defense to the people of Hawaii. Aveda Lifestyle Salon & Spa takes its clients away from everyday stresses. 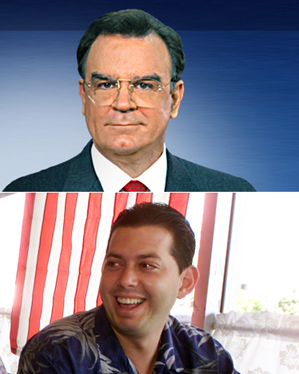 Larry Price and Michael W. Perry continue to rule the airwaves with their popular show. But it's not just in a time of emergency that islanders listen to Perry & Price; as our recent survey shows, the radio duo is an everyday favorite. 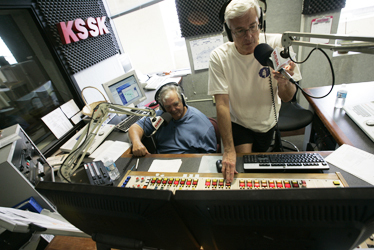 Perry and Price are on air from 5 to 10 a.m. Monday through Friday and from 6 a.m. to 11 a.m. on Saturdays. On two Saturdays a month, they do the Perry and Price show live from John Dominis restaurant. 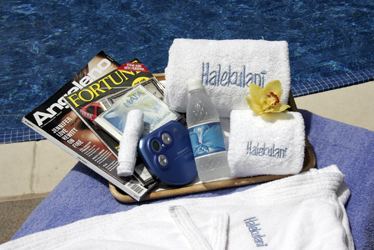 Awards are nothing new to the Halekulani hotel, which was named World's Best Hotel Service in 2007 by Travel & Leisure, No. 1 Destination in Hawaii by Forbes.com in 2006, Pacific Rim Resorts Top 30 by Conde Nast Reader's Choice Awards in 2005 and many, many more. But hotel officials said they were "deeply honored" to have been voted Best Luxury Hotel by Star-Bulletin/MidWeek readers. "This hotel was first a private residence and we are committed to always welcoming the people of Hawaii to retreat, relax and enjoy the peace and tranquility of our House Befitting Heaven, on the beach at Waikiki," said Janis Clapoff, general manager. "Halekulani has a legacy dating back to the early 1800s and has evolved as a global luxury brand and leader in the hospitality industry. We have done this by consistently developing authentic experiences that reflect and satisfy the interests and needs of our ever-discerning guests." 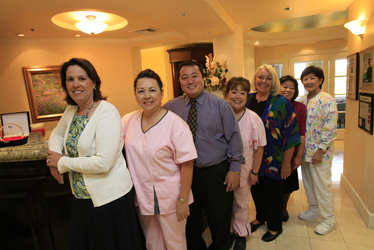 Dr. Wynn Okuda, third from left, and his staff pamper their patients. 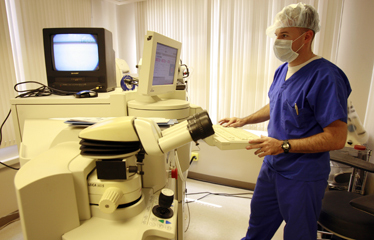 Dr. John Olkowski is the Lasik surgeon that catches Hawaii's eye. KHON's Joe Moore and Kanoa Leahey.